For as little as $10 a piece, 16 artists offer the humble tee as works of wearable art. 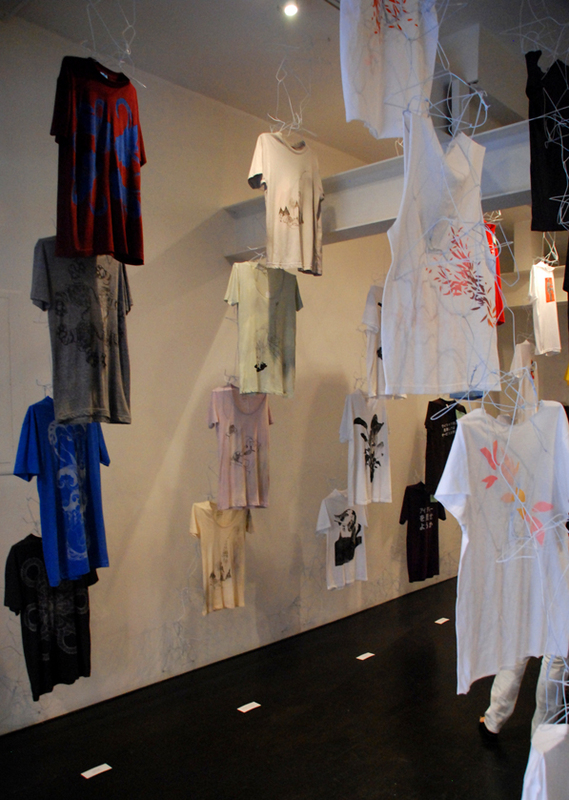 Artist and curator Jennifer Salomon launched the first in a planned series of custom T-shirt exhibitions at On Stellar Rays last month with “One Size Fits All.” Hand-painted shirts of 16 different artists adorn the gallery, draped from a wire hangar installation by James O’Meara. The “One Size Fits All” runs through August 22, 2009 at On Stellar Rays on the Lower East Side. Artists include Agata Bebecka, Michael Paul Britto, CHANDI, Brendan Fernandes, Isca Greenfield-Sanders, Brent Harada, Donna Huanca & DOMOKOS, Akiko Ichikawa, Tony Ingrisano, Adrian K, Caitlin Masley, Haley Mellin, Chris Oh, Rachel Salomon, Jenny Salomon, Nichole van Beek, Yadir Quintana, and installation by James O’Meara.